Yuccas are hardy or half-hardy perennials that range from 30 cm to 2.5 meters in height. Yucca's have very thick woody stems and spiky sword shaped leaves leaves. They bloom from the middle of summer through autumn, when they carry white flowers. 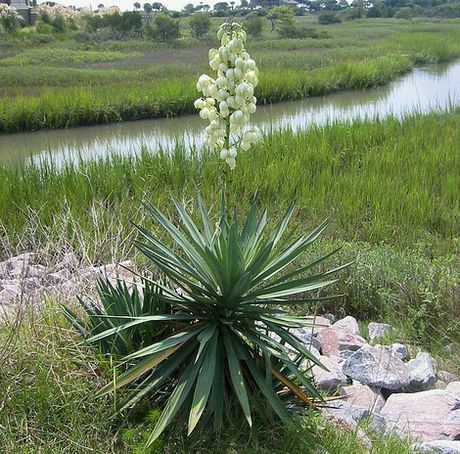 Some common names for the Yucca plant include Soapweed, Spanish Dagger, Spanish Bayonet and Adam's needle. If you have children or pets it is probably not a good idea to grow yucca plants in the garden as they have razor sharp leaves that can easily hurt people and animals. Photograph by Terren in Virginia. Requirements and Plant Care: Full sunlight. Good drainage. Can survive in dry and poor soils. Soil pH 5.5 to 7.5. Caution always wear protective, preferably chain mail or similar gloves when caring for Yucca Plants. Tidy leaves up to stop from becoming scruffy. Propagate: by planting offsets or from root cuttings. Miscellaneous: Leaves can be very sharp, think seriously about the safety of children and animals before growing yucca in the garden. Yucca plants bloom at night. The plants have mutualistic relationship with the Yucca moth, which acts as a pollinator and lays eggs in the plant. Other Lepidoptera that are attractive to these plants include the Yucca, Ursine and Strecker’s Giant Skipper. Red Yucca (Hesperaloe parvifolia) is not a true yucca, but is actually a member of the Agave family. Plants have large, stiff, and sword like rosette leaves, are a genus of perennial trees and shrubs from the family Asparagaceae, and are contained within the subfamily Agavoideae. Plants are native to dry and hot parts of South, Central and North America, and the Caribbean, and are currently one of the main gardening trends in the United Kingdom when it comes to landscaping and home garden plants. There are nine species and 24 subspecies of Yucca, and their distribution covers a vast area of Central and North America. Yuccas have adapted to a vast range of ecological and climatic conditions as is demonstrated by its distributional spread from the Gulf of Mexico to the drier central states such in Alberta in Canada, and through to the inland neighboring states and the Atlantic coastal. Plants are found in badlands and rocky deserts, in grassland and prairies, in light woodland, in mountainous regions, in semi-temperate and subtropical zones and even in coastal sands (Yucca filamentosa); though these areas are generally arid to semi-arid. Yucca angustissima - Narrow Leaf Yucca Plant by brewbooks. Yuccas are generally known as ornamental plants in gardens and there are several yucca species that bear edible parts such as flowers, flowering stem, seeds, fruits and roots. The use of yucca roots as food often comes from the confusion with the same spelled, yet unrelated to yucca botanically, Manihot esculenta, commonly known as cassava. That said there are many yucca plant uses, for example: the roots of Yucca elata (soaptree yucca), are rich in saponins and are used in Native American rituals as a shampoo. Trunk fibers and dried yucca leaves makes the plant perfect for use in fires that are started through fiction as they have a low ignition temperature. Species such as Yucca filamentosa, in rural Appalachian areas, are coined as “meat hangers”, as its sharp spiny tips and tough fibrous leaves are used in puncturing meat as well as knotted in order to form a loop wherein meat can be hung in smoking houses or for salt curing. The mutualistic pollination system of yuccas is very specialized as they are pollinated by the yucca moths from the family Prodoxidae. Yucca moths will transfer the pollen purposely from the stamen of one plant to the stigma of another pant, whilst laying eggs in the flower at the same time. The moth larva will be feeding on some of the developing seeds; there are more than enough seeds left to perpetuate the species. Different species of yucca serve as host plants for the caterpillar of the Ursine Giant-Skipper (Megathymus ursus), Yucca Giant-Skipper (Megathymus yuccae), and Strecker's Giant-Skipper (Megathymus streckeri). See this page for information on growing butterfly garden plants. Yucca baccata. Also known as Banana Yucca due to the shape of its fruits; these can be eaten and baked like a sweet potato. “Datil yucca” is the other term for this variant in some locations as the plant has some resemblance to an agave. It has shorter trunk and bluer or more glacous folialge compared to other yuccas such as the Mojave yucca. It grows five feet and up in dry soil and full sun. Purple and off-white flowers will start to appear from mid-April to July. Yucca carnerosana (Yucca faxoniana). This variety can grow 12 feet tall by six feet wide and is native in Mexico and Texas. It grows in part shade and full sun in zones 8a to 11, although gardeners from zone 6 particularly in Denver, CO are reported to be growing yucca successfully. They produce white flowers that will turn into a pretty shade of pink in mid to late spring when the plant blooms. Yucca glauca. Produces grey to green leaves that form two foot mounds across the dry South-western part of the United States. This variety requires a dry climate and sandy soil in order to bloom. Flower stalks shoot will start to appear in early summer from the plant’s crown. Each stalk can produce up to 15 aromatic, greenish white flowers. The crown of the plant will die after blooming. Yucca pallida. This variety is alternatively referred to as pale yucca due to its grey-green or blue-green leaves that form a rosette one or two inches tall. It is natively grown in Texas. Pale-leaf yucca can tolerate partial shade and full sun and its white flowers will start to appear in mid-summer; these are held on upright stalks a couple of inches from the leaf tips. Yucca rigida. A beautiful yucca palm that is also called as Blue yucca or Palmilla due to its striking blue-gray leaves; these go well with its creamy yellow flower clusters. It is known to be enduring of zones eight to ten, and has also been reported as surviving the Phoenix, Arizona winters. The branching canes of Yucca rigida can grow up to 15 feet tall and six feet wide. Yucca rostrata. Another type of beautiful blue yucca, which is commonly called the Blue Beaked yucca plant. It can be grown in cold places even in zone 5, as has been recorded in New York State and is one of the most cold hardy amongst the Yucca species. Yucca rupicola. Fascinating type of yucca as its leaves are unique from that of other yucca leaves. The leaves are dark green in colour; strap shaped, two inches wide, and form rosettes not greater than two feet tall. 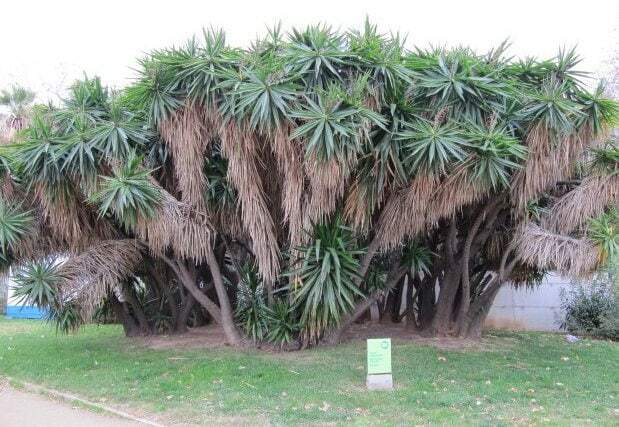 It is also termed as the Twisted-leaf yucca due to the ability of its leaves to twist with age. Yucca rupicola features red or white edges as well as curly white hairs, which are yuccan fiber. It can grow in partial shade and full sunlight and is native in Texas. Yucca schidigera. Also known as Mojave yucca, this is basically a yucca tree. One of its common names is Spanish Dagger because of the sharpness of the tips of its yellow-green leaves. Its heavy canes can reach around six to 12 inches when the plant matures and will produce white flowers with a purple tinge. Yucca schidigera should be planted well away from foot traffic. It is closely related with Yucca baccata, and hybridizes freely with it; they both inhibit the same range. Yucca schidigera is native to the Sonoran and Mojave deserts of Arizona, Nevada and California. Yucca gigantea (Synonyms: Yucca elephantipes and Y. guatemalensis). this is the tallest if the yuccas and can reach heights of thirty feet (9 M). It is commonly referred to as the Giant, Spineless, or Soft-tip Yucca. It blooms with white flowers in the summer. The Yucca elephantipes plants are drought-tolerant and often grown indoors as house-plants when they are young. Wikipedia; Yucca Moths; GardenWeb; Ask the Gardener; Utah State Extension; Yucca Taxonomy. Some species, such as Yucca elephantipes, can have spreads of well over 6 M. Photograph by Wallygrom. Yucca plants (shrubs variety) can be grown both indoors and out. Bigger varieties are planted outdoors whilst smaller ones can occupy spaces indoors. They can also be planted in pots and containers as well as in garden beds, depending on what is available to the gardener. Many people enjoy growing yucca plants indoors because they are low maintenance and have the ability to clean the air. They are also used as decorations to enhance a home and perhaps give it a Southwestern USA theme. Choose a location that has access to full sun. Although Yuccas can tolerate partial shade, they grow best under full sunlight. The soil should be somewhat dry and well-drained as the roots of Yuccas rot easily in wet soil. If you want to grow Yucca tree from seed then it is best to start indoors. Yucca seeds take anything from one month to one year to germinate and are best sown at the end of winter. Germinate Yucca at 18 to 25 degrees centigrade and grow them indoors for about three years. It is best to keep yucca indoors in a safe place if you have children or pets but if required in the garden then transplant them outdoors a few weeks after the last chance of any frost in the spring. Yuccas are not overly fond of pot cultivation but they are usually fine when large pots are used. A three litre rose pot for a young seedling up to three years of age. For older plants, use ten litre pots or bigger. Make sure the growing spot has access to full sun as yuccas planted indoors with limited light and root run, often have a dwarfish look. Though this look is actually the desired one for some indoor yuccas. It is probably easiest to purchase plants from a garden Centre or to plant from cuttings or offsets. Depending on the species space at 45 to 60 cm apart (small), 60 cm to 90 cm (medium) or up to 1.2 metres apart for larger varieties. Ideally they should be grown in a sunny area that has a poor soil with excellent drainage and a pH of 5.5 to 7.5. Raised Beds: Outdoor planting for most species requires well-drained raised beds. Although some varieties can be grown unprotected, some beds need to be protected against winter moisture. Species that can be grown in unprotected beds include Yucca glauca, Yucca filamentosa, Yucca 'Karlsruhensis', Yucca flaccida, Yucca angustissima ssp. kanabensis, and several hybrids such as Yucca 'Hybrid No. 1402' and 'Hybrid No. 500'. The constructed beds must be raised so as to leans towards the sun so that the plants get as much light as possible. Usage of granite boulders is advisable to help raise the bed above the subsoil. There should be seven to 16 inches layer of granite stones in the bottom of the beds and two inches layer of gravel on top of this. Use a one to two inches layer of ½ inch sized granite chippings to top dress as this can help keep the root neck dry. After digging a hole with the use of shovel to inspect the soil type, add small pebbled gravel or sand to implement the soil where the yucca is about to be planted. To do this, dig a hole that is twice as deep and wide as the root ball of the yucca plant. Put the extracted soil into a huge container or bucket and add gravel or sand to the soil to make the planting bed 50 percent gravel/sand and 50 percent soil. Placing some organic matter is beneficial; add more gravel or sand mixture if the soil has a heavy clay base to increase the drainage. Place two to three inches of the soil mixture into the bottom of the hole and put the root ball of the yucca plant on top of it. Ensure that the plant is straight and centered. Fill in around the root ball with the remaining soil mixture until it reaches the soil surface level. Gently press the soil to release any pockets of air. Sprinkle light water to the plant. Additional water can be added two to three weeks after planting. Outdoor yucca plant care: Plants prefer dry soil that has full access to the sun. Avoid overwatering the plant as this can cause rotting of the roots. Cut off all the dead leaves in order to keep the plant neat. Make sure to wear heavy gloves to prevent the leaves from cutting your hands. Yuccas are not fond of being transplanted, so make sure that you will choose the right location before planting them. A once a year feeding is sufficient as yuccas survive well in areas of low nutrients and are light eaters. For potted houseplant – Yucca plant care indoors: make sure that the plant has sufficient access to intense light. Use heavy pots as yuccas tend to be heavy in both their stem and foliage. When watering, simply sprinkle water on the top of the plant if the soil feels dry. Although yuccas do not prefer to watered heavily, draught or lack of water can cause the leaves to turn brown or yellow. Other than pruning a Yucca plant pretty much cares after itself. Houseplants may require a low-nitrogen fertilizer a couple of times per year. When grown outdoors, apply a time-release fertilizer in a circle around the where you expect the roots to be. It is important to tidy plants regularly. As they have very sharp foliage ensure that you wear protective chain mail or very tough gloves when doing any pruning or removal of yucca plants as they can easily cut off a finger! 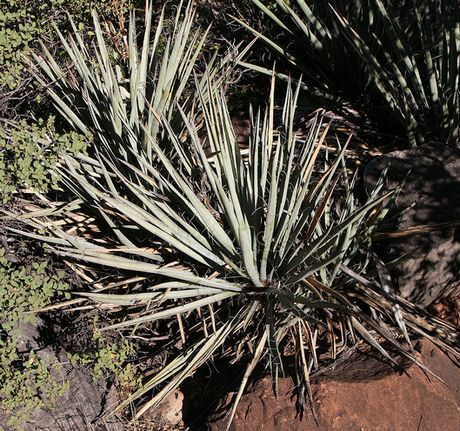 Similar to many other plants, Yuccas are best pruned right before they enter the growth period, which is usually in early spring, though this period can be extended to the beginning of summer. Cutting off the flower stalks of yuccas after the blooms have faded is also necessary to ensure a tidy appearance. With the use of a sharp cutters or pruning shears, cut the stalk off at about three to four inches above where the stalk had emerged from the main stem. Make sure that the plant receives a lot of light when it is recovering. When propagating it is important to use mature tissue (in order to prevent root rot), and perform propagation in the spring. Cut off the leafy top after marking the trunk, remove all of the upper leaves and then plant the trunk in potting soil with the end that formerly had the leaves pointing up. Now relocate the pot to a shady area. The trunk is expected to have rooted itself within two to three weeks of planting, and will start to produce new leaves. After a wet warm winter, rust fungus can occur. This can be prevented by protecting the plants against heavy winter moisture with the use of a sheet of glass. Slugs and snails can wreck havoc to Yucca seedlings. Use common insecticide to get rid of these pests. Red-orange spores or lesions of the leaves are indications of a fungal disease. The infected leaves must be removed immediately in order to prevent spreading. Speckling on the leaves as well as gray webs are signs of spotted mites. In order to control this infestation, use insecticidal soaps and prune dead leaves off the plant.